This is an original 1st Day of Issue from The U.P. 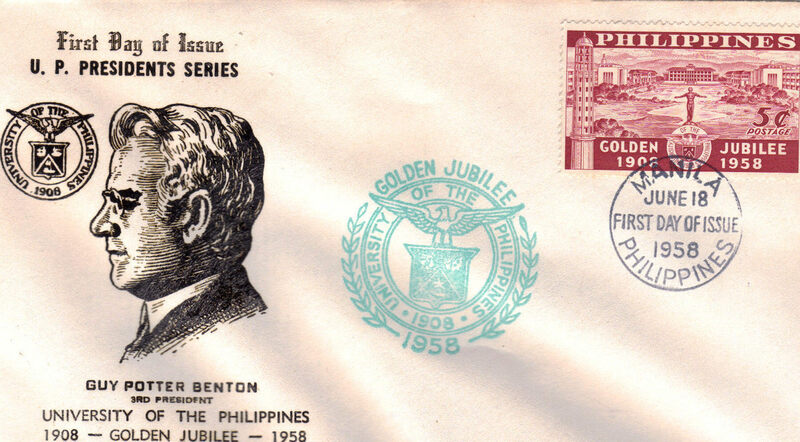 Presidents Series of the University of The Philippines celebrating its Golden Jubilee 1908 - 1958 featuring GUY POTTER BENTON, the 3rd U.P. President. Issued in Manila, Philipines June 18th 1958, stamped as well. Measures 6-1/2" L x 3-5/8" H Weathered by age and storage, has ink smudge from envelope stacked behind it otherwise, in exceptional condition. Send email if you need additional details. Buyer is responsible for 1.95 shipping to anywhere in the USA Canada. Send email for international rates. Do check the store for many more Las Vegas Collectibles daily. Thanks for stopping by!